Photo Explosion has the distinction of being the very first software of its kind to deliver powerful editing features, spectacular special effects and professional-quality photo projects all together in one program. 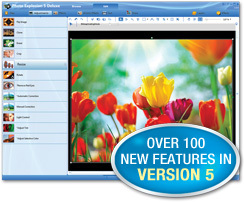 Photo Explosion 5 Deluxe makes creating with digital photography easier than ever with a brand new user interface, 10,000+ photo projects & graphics and an improved workflow for editing, archiving and sharing with friends and family. What’s more, Photo Explosion 5 is packed with over 200 exciting new features - all designed to let you get the most out of your digital camera and mobile phone photos! Photo Explosion Deluxe 5 – it’s the next generation in photo editing software and the only digital photo studio suite you'll ever need. Easily use photos from your digital camera, mobile phone, scanner, photo CDs or the Internet. Put your photos into albums with easy to use photo organizing software. Add keywords and ratings to find photos fast. Print multiples to save ink and paper. 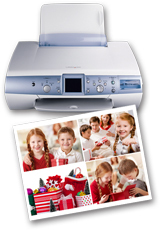 Print your photos with layouts for instant passport, wallet, 4x6, 5x7 and 8x10 prints and much more. Automatically send photos to social networking sites and friends and family via email. Turn your photographs into calendars, greeting cards, scrapbooks and other keepsakes for friends and family. Photo Explosion includes 3,000+ ready-made design templates in every project category imaginable! 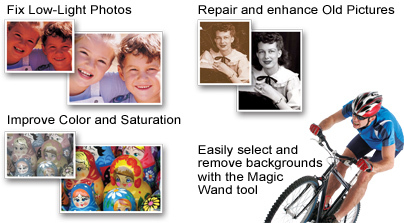 It’s easy to improve photos and repair photo flaws instantly. With one click you can fix exposure, adjust lighting & color saturation, sharpen images, crop, rotate, resize and more. Make every portrait picture perfect with all NEW retouching tools. Remove red-eye or wrinkles. Even add a tan, thicken hair and brighten teeth. Choose from a complete range of artistic styles and special effects that instantly turn photos into works of art - watercolor, monochrome, impressionist, cubism, blur background, bubbles and more. Take advantage of Photo Explosion Deluxe's easy-to use transparency and cloning tools to make collages with truly stunning results! Choose from a vast Graphics Library to decorate your photos with including frames in a variety of sizes. You can even use props like talking balloons, accents and disguises. The creative possibilities are endless! Add captions with eye-catching text effects. Instantly apply gradients, drop shadows, 3D effects and more. Each word can be your own visual masterpiece! Easily turn a series of photos into 360° or wide-angle panoramas. Photo Explosion Deluxe makes it easy with automatic photo stitching, alignment and color blending tools. Create vector objects, shapes, lines and text with easy-to-use freehand tools. 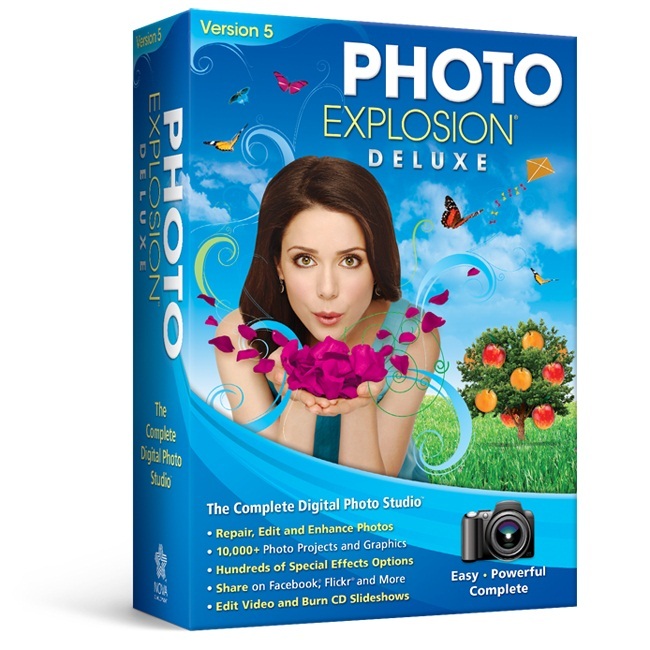 Photo Explosion Deluxe includes morphing - all you need is a "Before" and "After" shot! Easily save your morphs into popular formats to add to video or upload to YouTube, Facebook and more. Turn photos into lasting memories with unique custom layouts for scrapbooks and photo albums. Turn photographs into greeting cards, photo cards, calendars, newsletters, family trees and more. With 3,000 + designs to choose from, you’ll capture the excitement of any occasion or event. Create movies and slideshows using simple but powerful editing tools. Capture video from cell phones, digital cameras and camcorders, then edit, enhance and share online with friends and family across the miles. Or burn photo slideshows onto CDs that play on most DVD players. Customize your slideshows with menus, backgrounds, transitions and background music. Photo Explosion owners receive special discount offers on professionally printed greeting cards, announcements, photo canvases and more! 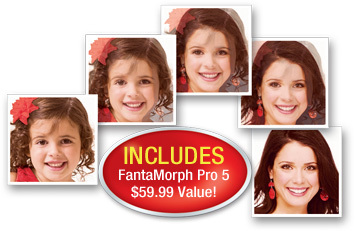 No other digital photo software offers you more! Capture photos from mobile phones, digital cameras, scanners, photo CDs, camcorders, the Internet and more. Guaranteed compatible with all types of digital cameras including Point & Shoot, Compact, SLRs, Mobile Phones, Camcorders, Web Cams and more. Multimedia file browser/viewer to organize files into on-screen albums. Add keywords and ratings to find photos fast. New easy-to-use interface with drag and drop simplicity. Automatically straighten, crop, adjust brightness & contrast, hue & saturation or focus with one click. Trim photos into unique shapes. Adjust focus, lighting and color balance. Remove red-eye or change eye color. Cut out parts of photos to insert/combine with other photos. Easily clone parts of one photo onto another. Use paint tools with edge and transparency options to accent photos. Make any portrait picture perfect with easy-to-use retouching tools. 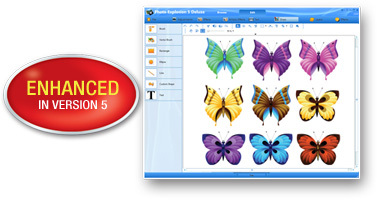 View photo effects in the preview display before applying them; easily undo changes. Use automatic or advanced manual control for photo effects. Apply artistic effects such as sepia, water color, cubism, monochrome, pixelate, blur background and more. Powerful drawing and freehand tools to create vector objects, shapes, lines and text. Add captions to photos with colorful eye-catching text. Transform text into different shapes and perspectives. Apply special effects like ripple, clouds, fire, glow, balloon and more. Apply drop shadows and gradients to text. Easily transform a series of photos into 360° or wide-angle panoramas. Automatic photo stitching, alignment and color blending tools. Post your panoramas online or e-mail them and allow the viewer to "walk through" the scene. A “Before” and “After” shot is all you need to create morphs. Easily save morphs in popular formats to add to videos or upload to social networking sites. Instantly print contact sheets or thumbnail CD covers for photo albums. Easily print multiple photo sizes; choose from layouts for instant passport, wallet size, 4x6, 5x7 and 8x10 and more. Turn photographs into greeting cards, posters, scrapbooks, calendars and other memorable keepsakes with over 3,000+ ready-made project templates. Send photos - or entire albums - to family and friends with no special software required to viewing. Create albums and slideshows with music and animation. Send them via e-mail or post them to social networking sites. Share photos on your mobile phone. Save photos in formats compatible with virtually all handheld devices. Create movies & slideshows with simple but powerful editing features. Import video from cell phones, digital cameras and camcorders. Edit and enhance videos with easy to use features. Customize with music, sound effects and titles. 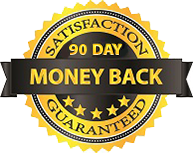 Enhance with eye catching special effects and transitions. Share on mobile phones, tablets or online. Burn photo slideshows onto CDs playable on most DVD players. Photo Explosion owners receive special discount offers on professionally printed greeting cards, announcements, photo canvases and more.